Temple of Isis Slots - Review it before you play NOW! Step 1 – If you are ready to begin playing on Temple Of Isis Slots, click the change bet button to alter your bet from the minimum wager of 1p upwards. 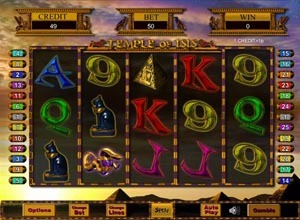 Step 2 – There are a total of 25 pay lines spread over five reels in Temple Of Isis slots. You can alter how many you wish to have active in your game, by clicking on the change lines button on the bottom menu bar. Step 3 – The game features an auto play button that allows you make play again and again with the same wager when clicked. If you're ready to go, hit the spin button. Anything you win will be highlighted on the appropriate pay line. Temple Of Isis Slot machine is another one of Boss Media Software's casino game and as such, it has the look and feel of many of their other games. What is different is the way this game looks, and that is has been through a re-design recently to make it more dynamic, visually. As expected with an Ancient Egyptian game, the colours of light and bright, with plenty of sandstone colours and aged effects giving the game a nifty historic look to it. There have been Temple Of Isis games before it, and although the principle hasn't changed some of the icons have undergone changes too. Looking more sharp and digitally rendered than ever, the symbols on the five reels catch your eye immediately; which most certainly helps when you're eagerly awaiting those reels to stop spinning. The card numbers and letters appear in multiple colours, as do classical Ancient Egyptian images of Egyptian priestesses, pyramids, scarab beetles and the eye of Ra. The priestess in this Temple Of Isis slot is your wild card, which can replace all other symbols bar the scatter card, which is represented by a pyramid. Collect three pyramids on the reels and you will be rewarded with 15 free games. Should you be fortunate enough to earn this, you're winnings will be multiplied on your free spins! For the jackpot of 9,500 coins, you will need to bag five priestesses across your five reels with the maximum pay lines and maximum bets both activated in your game. 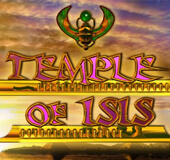 If you fancy trying out the game, you can play the Temple Of Isis Demo in almost any Online Bingo or online bingo site that houses the play for real money version. Playing Temple Of Isis free is a great way to learn the winning combinations, and if you want to get your hands on Pharaoh's gold, it can't hurt to practice can it?